Maldives Democratic Party (MDP)’s Mass protest calling for the resignation of President Dr. Waheed and to hold early presidential elections at Lonuziyaaraih Kolhu. Large numbers of people have gathered at the protest. 17th February 2012. 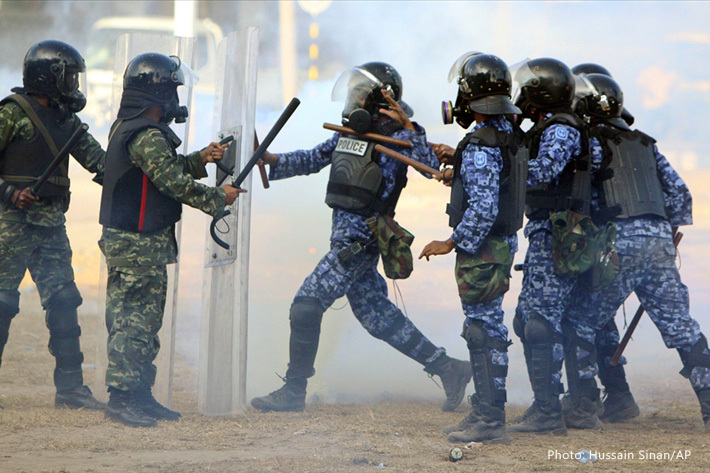 Maldives President Mohamed Nasheed of the Maldives resigned on Tuesday after weeks of protests erupted into a police mutiny, leaving the man widely credited with bringing democracy to the paradise islands accused of being as dictatorial as his predecessor. Nasheed handed power over the Indian Ocean archipelago to Vice-President Mohamed Waheed Hassan Manik, who was sworn in in the afternoon, explaining that continuing in office would result in his having to use force against the people. President Mohamed Nasheed of the Maldives resigned on Tuesday after weeks of protests erupted into a police mutiny, leaving the man widely credited with bringing democracy to the paradise islands accused of being as dictatorial as his predecessor.